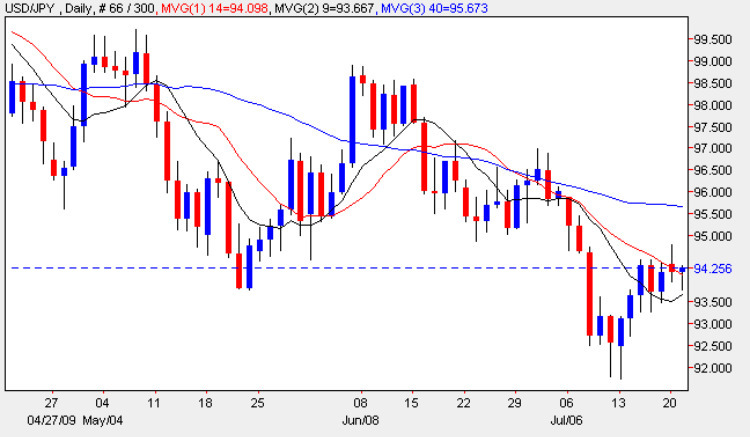 The yen to dollar currency pair continues to flirt with the strong resistance level above, with yesterday’s candle probing this area before closing with a deep upper shadow and small body, in a shooting star candle, which now looks weak, and suggesting a possible reversal once again. As outlined in last week’s market commentary, the dollar yen is now looking unstable and any trading in the pair should be restricted to intraday trades only, as the competing fortunes of two heavyweight safe haven currencies are now slugging it out once again in the market. Yesterday was of course a national holiday in Japan, so thin trading volumes added to the general nervousness surrounding the pair, and with Bernanke testifying for two days in the US, this could tip the balance in favour of the Japanese yen. Technically the resistance level at the $95 price handle still look strong, and any upwards move would need to have considerable momentum to penetrate this completely, so for today we need to take a wait and see approach for the start of the proceedings in the US.